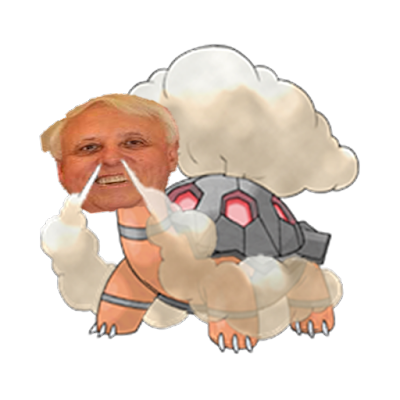 The Torkoal of West Virginia, Governor Jim Justice! We hope Democrats will appreciate that keeping Torkoal alive — they haven't forgotten about their previously strong pro-non-human-living-creatures stance, right? — actually helps in their pro-solar energy stance. After all, the reason that Torkoal is prominent once more is because Torkoal in the Alola region have been spotted with the Drought ability. Drought means more sunlight, which means more solar energy. Supporting the coal industry helps the solar energy industry. Now THAT'S an all-of-the-above energy policy! Some say (including Al Gore, not that anyone listens to him anymore) the reason Drought is now an ability is because global warming (or “climate change”) has gotten to an extreme and irreversible point. The left-wing blames animals and Pokémon alike, wishing for the genocide of methane-emitting cows and coal-emitting Torkoal. We're happy to have real conservationists like Jim Justice along with us in opposing this leftist agenda. He stands for, well, justice. We at KoopaTV will defend these precious gifts to the universe! This post was directly influenced by the concurrence of West Virginia governor Jim Justice changing his party from Democrat to Republican, and the serebii.net Pokémon of the Week being Torkoal, around the same time. This article was updated shortly after it was published to replace the picture of the Jim Justice-Torkoal fusion. It originally featured Mr. Justice in his whole suit fused with Torkoal. KoopaTV believes this new picture is better. Naughty people are very important to the coal industry. Ludwig thinks global warming is a hoax anyway. Former West Virginian coal CEO Don Blankenship is also given the turtle treatment. The Green New Deal being thrown about is all about killing animals that contribute to so-called global warming.